Montalvo Arts Center | Art on the Grounds | "Prince of whim"
In June 2010, Montalvo collaborated with East Bay sculptor Ann Weber to create a series of new commissioned works. Weber created large-scale, site-specific impermanent sculptures constructed of recycled cardboard. The concepts for the 8'-10' sculptures originate from tiny seeds, pods, cocoons, or cones the artist found on the grounds. Translated into sculptures they are transformed; Weber states, “The resulting sculptures create a dialogue with their environment, introducing an element of discovery and surprise within Montalvo’s grounds, and recalling, in their transience, the temporality of existence.” The works reflect objects and cultural ideas drawn from the natural surroundings, while juxtaposing elements of suspension and resolution, rebirth and regeneration. 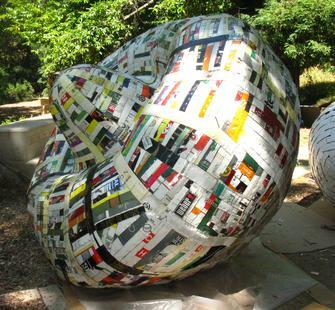 Weber, who was in residence at the Lucas Artists Residency Program for the month of June, created the sculptures on-site assisted by a corps of community volunteers.